When someone asks me what my favorite thing is to cook, I usually reply, “Something I’ve never made before.” My backup answer is “Macaroni and cheese, and it’s the name of my blog!” (Ha.) So, when I make something for the second time, it must be a real winner. This was the second time I’ve made these sweet potato burritos, so that’s saying something about the meal’s caliber! Actually, the first time I made the sweet potato burritos, the leftovers didn’t even last 24 hours. I ate one and a half for dinner, another half later that night, and another whole burrito when I got home really late after going out. There may or may not have been an avocado salsa-related accident in the kitchen with a trajectory that left salsa in the most absurd places (behind the stove? on the cabinets?). The roasted peppers and sweet potatoes add a great smokey flavor, that contrasts with the tangy, rich and creamy, slightly spicy salsa. And the crunch of lettuce and red onion is refreshing on top. 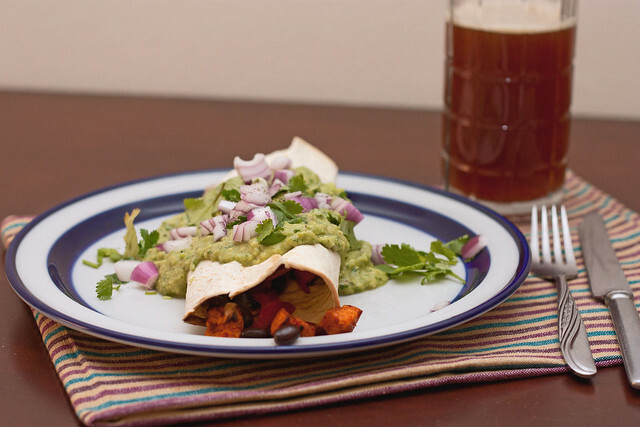 These sweet potato burritos are a great Mexican-inspired dish that won’t leave you feeling weighed down. And without the cheese and sour cream, they’re a super easy vegan meal! To roast the red peppers, place peppers on a baking sheet lined with aluminum foil. Place under the broiler, rotating every few minutes until the peppers are almost completely black all over. Remove from the oven. 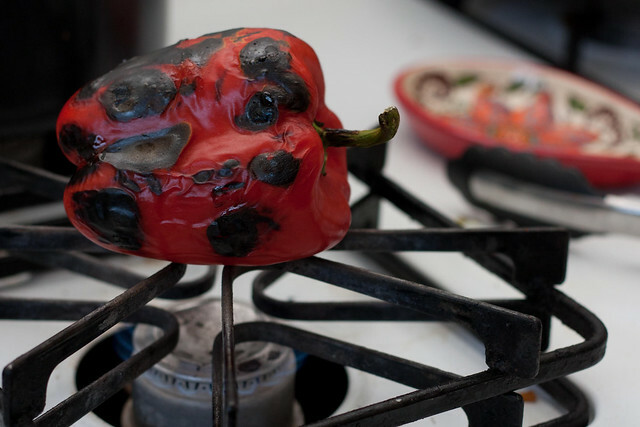 Alternatively, place the peppers above a gas stove flame, rotating until it is almost completely black all over. Place peppers in a paper bag or wrap in aluminum foil for at least 10 minutes to steam. Remove the skins, seeds, and stem. Roughly chop and set aside. 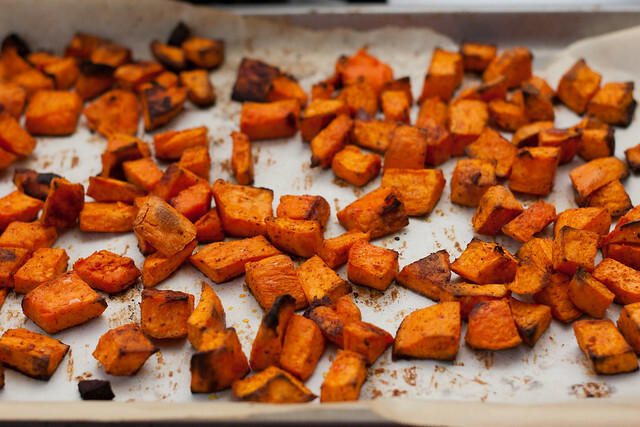 Preheat the oven to 450 degrees F. Wash and peel the sweet potatoes. Chop them into bite-sized pieces and toss with about 2 tbsp olive oil, cumin, paprika, cayenne, salt and pepper. Spread on a baking sheet lined with parchment. Bake for about 45 minutes, stirring the sweet potatoes about halfway through. While the sweet potatoes cook, prepare the avocado salsa verde. In a food processor or good blender, combine avocados, salsa verde, garlic, jalapeño, lime juice, cilantro, and salt. Taste, and add a little more salt or lime juice if necessary. Make sure your oven is still at 450 degrees F. To prepare the burritos, combine a big scoop of sweet potatoes, beans, and red peppers in each tortilla. Put a hearty sprinkle of jack cheese on top, roll up, and place on a baking sheet lined with parchment paper. Bake your burritos for about 5 minutes, until the cheese is melted and the tortillas are lightly toasted. Serve burritos with avocado salsa verde on top, garnished with lettuce, onion, jalapeño, and sour cream. Enjoy! 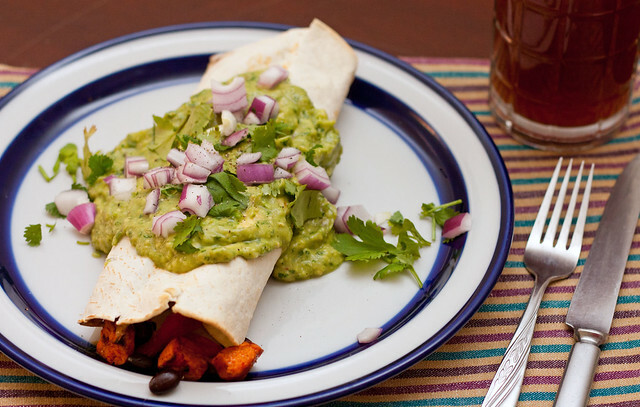 For leftovers: store the burritos in one container and the salsa verde/toppings in another. Reheat the burrito in the microwave, then top with the salsa!